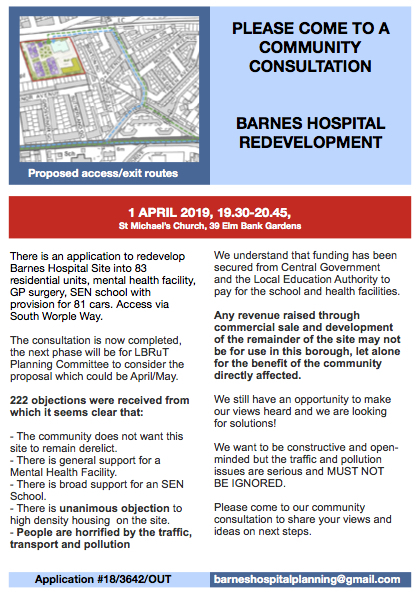 A group of concerned locals is holding a community consultation about the planned development on the Barnes Hospital site. 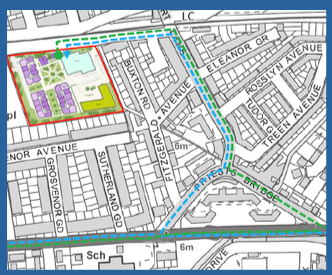 There is an application to redevelop Barnes Hospital Site into 83 residential units, mental health facility, GP surgery, SEN school with provision for 81 cars. Access via South Worple Way. The consultation is now completed (with 224 objections), the next phase will be for LBRuT Planning Committee to consider the proposal which could be April/May. According to the group of locals, the objections to the application show that there is broad support for the mental health facility and the SEN school. However, there is unanimous objection to high density housing on the site and traffic, transport and pollution issues are a major concern. The organisers of the community consultation are asking locals to come to the event to share their views and ideas on next steps. The community consultation is taking place on Monday 1 April from 19:30pm to 20:45pm at St Michael’s Church, 39 Elm Gardens. 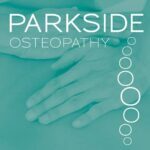 Get in touch with the organisers via email: barneshospitalplanning@gmail.com.